I’m from a small town called Kimbe, which is located in West New Britain Province in Papua New Guinea. My family still live there. I wanted to come to JCU before I even moved to Townsville. I saw an ad on TV about JCU and said to my dad — that’s where I want to go to uni. He said that I had better start working hard then! So I moved to Australia when I was in Grade 11, I moved away from my parents and family. It was challenging not seeing my parents every day, but I enjoy living in Townsville. The people here are really nice and I love the Cowboys, the local National Rugby League team. University is so different to high school but I do like going to lectures and tutorials much more than high school. There were challenges, like understanding the subjects and learning to think like an engineer. Now, when I’m given a problem, I think about how an engineer would go about solving it— and I try to analyse each solution to the best of my ability. There is so much support here at JCU. My lecturers are really helpful, they are free to talk to you whenever you need help. When you pass them in the hallway, they know you by name, which is nice as you don’t feel like just a number. There are mentoring services and private tutoring offered as well as helpful classmates, which is great as there’s always someone to talk to if I need help. There are many opportunities to get real-world experience. I was lucky enough to do a placement in PNG at an oil refinery and I was taught how the processes and control systems work for producing oil — I got to experience what a chemical engineer does in such an environment and I realised that I really like it! I want to be a consultant engineer in a company. 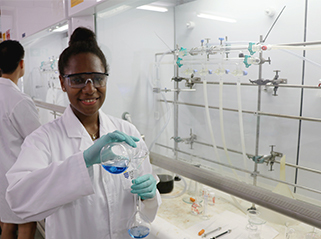 I’m planning on graduating, working in the field and coming back to JCU to study a Master’s degree in chemical engineering.